I flailed through scans and finally found one that I could wall: THIS. The strange blobs were supposed to be strange blobs. lol then they started looking like city-from-above, for a while. Now they just look like strange blobs again. Erm. Made a few versions, with the blobs and the original scan's layer edited out.. Red boots for Wizard-of-Oz reference lol. She's walking her way home, on the road not paved gold..
Browse Shel Gallery: Recent | Popular. gosh! I love your works! this one is awesome and great title too! all come together to create the picture. 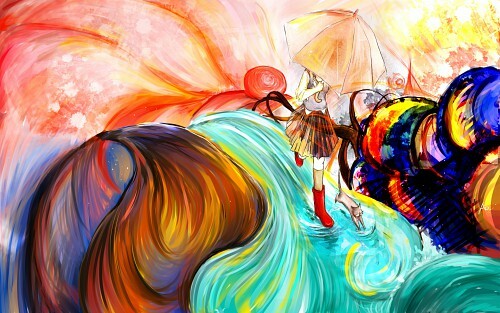 Ara ara, this is very colorful, the artistry may look a little over-enthusiastic but overall, they blend well together. Good job! It's like an EXPLOSION and you know how much I love colors <3 and and it's like water, but fluorescent and WHEE! No worries about it not being Muse or Zelda! Despite popular belief I do have other interests! The color combinations are unexpected, but you made them blend really well. such a pretty combination of colors, the girl and cat just gives the proper color combination. it's like finger painting and then the center piece being the girl and the cat. well done. waaaaa its so nice with all those colors, and the movement is wonderful! absolut fav! i love it! i adore this! pure talent! great color and a great wallpaper! Whooooa, this is so cool -- I love the bright colors! ooooh! its so pretty with all those colors! the movement is so flowy that gives te sensation that she's in a river ^^' nice! +fav! this is Soo cool... thanks. Gorgeous wallpaper is gorgeous >_< When I first saw it, I thought "this is what a dream would look like if it were perfectly captured on paper". It's all so chaotic and colorful, Freud would have a blast analyzing this! The background is just amazing, I love works where the bg shines more than the base image (the girl and cat, here). And I don't know what I can say other than incoherent mumbles, since the chaos here is so perfect that it's almost ordered <- wha? made no sense. Colors! Colors everywhere! It's vibrant, it's shiny, it's everywhere! This is downright amazing, there's no other words for it!